A few days ago, we had posted about user/beginner-friendly linux distribution, ChaletOS 16.04. for new linux user this distro is very helpful especially Windows refugees. - Easy-to-use GUI for installing and removing kernels offered. - Kcm module to integrate MSM into System-Settings of Plasma 5. Manjaro Linux 16.06 XFCE edition come with Xfce 4.12, mainly focused on polishing the user experience on the desktop and window manager, and on updating some components to take advantage of newly available technologies. 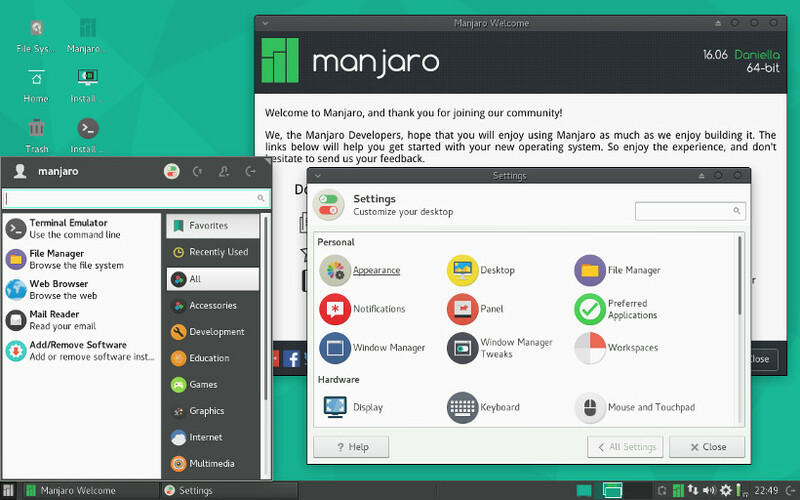 Manjaro Linux 16.06 KDE edition come with Plasma 5.6 desktop in combination with the latest KDE-Apps 16.04. deliver powerful, mature and feature-rich desktop environment with a unique look-and-feel. While Other Manjaro Linux 16.06 flavours like : BspWM, Budgie, Cinnamon, Deepin, Enlightenment, Fluxbox, Gnome, i3, JWM, LXDE, LXQT, MATE, Netbook, Openbox and PekWM can be downloaded Here.